Description of "Advance Mobile Repairing Course Hindi (eBook)"
Mobile phone/smart phone repairing course is the best career oriented course. It provides one of the best career opportunity to the students. We offers Advanced Chip Level Mobile Repairing Course in Hindi. This covers Mobile phone hardware training , mobile phone software training and chip level training. Under chip level training you learn the repairing of board of mobile. In this way you learn the complete course of mobile through practical training. We being offer all-in-one mobile repair courses for smartphones, android, blackberry, windows and many others. We provides repairing of all brands mobile phone like Acer, Adcom, Alcatel, Apple, Archos, Asus, BlackBerry, Celkon, China, Fly, Gionee, Google, HTC, Huawei, iBall, IBerry, Idea, Intex, Karbonn, Lava, Lemon, Lenovo, LG, Maxx Mobile, Micromax, Microsoft, Motorola, MTS, Nokia, Panasonic, Philips, Samsung, Sony, Spice, Swipe, Videocon, Xiaomi, Xolo, ZTE, Samsung, iPhone , VIVO, OPPO, One Plus etc. Experienced and certified instructors help students in enhancing their technical knowledge about working of different mobiles. We also provide ebook for learning offline Repairing especially for the students who are unable to attend the regular classes. Advance Mobile Repairing Course eBook is the foremost Mobile Repairing Book in India. In this ebook, We provide advance level Mobile Repair Course Hindi. Our entire course syllabus is simplified such that even a matriculate can grasp the concepts. In this eBook, We provide Smartphone Repair Training Course so that students able to fix software problems like hanging, network IC problem, touch problem, application problem, WI-FI not working, mobile getting slow down problem, password broken, etc and in hardware like battery drain, SD card not recognize, SIM not recognize, problem, audio jack, display problem, partially or total dead or more. What is so special in this eBook? • All Electronic Components Identification, Testing and Their Working. • Diodes & many more. • Soldering & De-soldering of All Type of Component, IC. • Soldering & De- soldering of Sim jack, LCD jack & charging jack. • Wi-Fi, Microphone / Mouthpiece, Speaker / Ear Piece, Camera, Radio Problems & Solutions. • File Flashing, Set Dead, On/Off, Hang, Restart etc. • What is the Difference Between in Repairing Point of view Smart phone & Mobile Phone? • Advanced mobile phones H/W Trouble Shooting with Circuit Chart. • Depict About Mobile Operating System of I-Phone, Blackberry, Samsung Android Phone. • Samsung Flashing ,Hard Reset. • I-Phone Factory Unlocking Overview. • Touchpad Fault Finding and Repairing/ Replacing. • Smart phone Motherboard Block Diagram. • Smart phone Motherboard Tracing in Circuit. • Mobile Phone Upgrading ,Jail Break,country Unlock . • Flashing, Formatting, File Back-up, User Unlocking etc. If you want to be successful mobile cell/smart phone repairing technician, so download now Advance Mobile Repairing Course PDF ebook on your smartphone. Learn A to Z Complete Mobile Repairing Training Course in Hindi on the your smartphone. Anywhere, Anytime. Aditya Jain is a Professional Smartphone Mobile Repair Technician Expert & Trainer from New Delhi. He has trained 1000+ students in Hi-MobiTechCare Institute. When they came to know that many students are not able to learn courses due to expensive fees. After, he create ebook & publish on Pothi.Com. Whereby each Student, to learn on their mobile phone in mobile repairing course Hindi. Advance Mobile Repairing Course Book is very useful for beginner learners. In this ebook, you will learn complete A to Z Mobile Cell Phone Repair Training Course fully practical step by step in Hindi. Download ebook now at very cheapest price. Reviews of "Advance Mobile Repairing Course Hindi (eBook)"
Book achi hai ji or mobile repairing course book ho to jarur batana. Puri jankari dene ke liye shukriya paji. Ab aap jald se mobile repairing video course banao ji. Very Nice Book on Mobile Repairing Book. It covers mobile software and hardware both. It is in Hindi Language. I would say it is the best Mobile Repairing Course Book in Hindi. Sir aapki book ki jitni tarrif karoo, utni kam hai. Maine aapki book ko mere frnd sanjay ke kahne par purchase kiya. Full course sikhne ke liye isse badiya book na to amazon par hai ba hi flipkart par. maine already amazon se 3 or flipkart se 5 mobile repair books kharid rakhi hai. Sir aapki book all in one hai. Vo 8 books milkar bhi aapke book ka compare nhi kar sakti. Maine 8 books ke lagbhag Rs.1678 pay kiye. But sir aapki book in sabhi se best hai. Sir maine aapka pdf book buy kiya or pura mobile repairing course achhe se sikha. Book me course ko acche se samjaya gya hai. Sir mujhe mobile phone ke all types ke spare parts chahiye. Sir kya online spare parts buy kar sakte hai. इस मोबाइल रिपेरिंग किताब ने मेरी मोबाइल रिपेयर सीखने में बहुत हेल्प की, अब मैं मोबाइल रिपेयरिंग शॉप पर हार्डवेयर रिपेयरिंग खुद से करके सीख रहा हुँ. सर सभी मोबाइल फोन की हार्डवेयर खराबियों की जम्पर डायग्राम वाली किताब भी चाहिये मुझे. मैं जम्पर किताब pdf डाउनलोड करना चाहता हुँ अापके पास है तो मुझे सम्पर्क करना. सर आपकी Advance मोबाइल रिपेयरिंग बुक बहुत अच्छी है इसके लिए आपका मैं हमेशा आभारी रहुँगा. Yah book bada important hai un sab ke liye jo android mobile repair karna sikhna chahate hai. Sach me full course ke bare me sikhne ke vaaste isse se badhiya achi book aapko koi nhi milegi. Ek baar jarur sikhiye. Sir book bahut acchi hai, mobile repairing sikhne ke liye. mobile cell phone repair kaise kiye jate hai ya full course kaise sikhe, vo sab is book me bahut ache se sikhya gya. Mobile repairing course sikhne walo ke liye ye bahut acchi book hai. और पुरा कोर्स बुक में दे रखा है. if you really want to learn mobile phone repairing course, this is best book for everyone who wants to repair android iphone smartphone mobiles. I suggest you, please read this book once. Most useful for everyone. Everyone must read who want to successful in mobile smartphone repair business. This book helps you to became a mobile repairing engineer practically.book has totally practical lessons. Jobless students should read this book & start your career in mobile repairing business. Good book for mobile repairing training. Changed my mindset. Please read this book if you think mobile repair is difficult. I have got my answers through this mobile repairing book. I wish everyone reads this book. We provide basic to advance training to fix troubleshooting in mobile phones of various brands. We have set-up a complete practical, software and tracing lab for quality training in the institute. Students can choose any of our mobile repair courses as per their interest. Wonderful mobile repair training course book, Isme diya course institute level ka hai. Or is book ki kimat bhi kam hai. Mobile repairing sikhne ke liye best book hai. I am Manish. Mai ek mobile repairing course institute mumbai me mobile smartphone repair trainer or expert hoon. Maine is ebook ko download kiya, i am shock. Jo hum institute me student ko nhi sikha paate usse kai advance level ka course is ebook me de rakha hai. Matlab itna acha course koi kaise itne kam price me logo ko provide kr skta hai. Agar is ebook me diye jitna course koi institute sikha bhi nhi skta. Agar koi institute sikhata bhi hai to is mobile repairing coursr ki fees 30000 ruppes se bhi adhik hongi. Please aap itne low price me book na sale kiya kare, iski price aap Rs.600-1000 tak rakh le, to bhi mobile repairing learners ke liye kam hi hai. Is book ke reason se hum har mahine 10-15 students kho rahe hai, jab hum unhe humhara mobile repairing syllabus batate hai to vo 2-3 days ke bad aane ka kahkar chale jate hai or kabhi nhi aate. Jab hum unhe call krke puchte hai to kahte hai "Advance Mobile Repairing Course Book se aap se adhik or accha course de rakha hai to aapke institute me 15 hazzar ruppes kyon kharcha kare"
Please aap book ka price badhaye taki kuch students institute bhi join kare. Aasha krta hoon ki aap humhari problems ko samjh gye honge. इसमें मोबाइल फोन रिपेयर ट्रैंनिंग कोर्स बहुत ही आसान तरीके से स्टेप से स्टेप समझाया गया है, इस बुक में दिये फोटो की हेल्प से अनपढ भी यह कोर्स बहुत ही आसानी से सीख सकता है. इस बुक में दिये कोर्स के आगे, इसकी कीमत बहुत कम रखी है, अगर यह बुक ₹500 की होती, तो भी मैं खरीद लेता. मेरी दिल्ली में मोबाइल रिपेयरिंग शॉप है, मोबाइल रिपेयर करते समय यह ई-बुक हमेशा मेरी हेल्प करती है. मेरी एक राय है, यह बुक सीखे हुये, नही सीखे हुये, मोबाइल रिपेयरिंग कोर्स सीखने वाले सभी के लिए बहुत उपयोगी है इस बुक से किसी भी स्मार्टफोन मोबाइल की छोटी बडी हार्डवेयर व सॉफ्टवेयर समस्याओ को आप बहुत ही सरल तरीको से समाधान खोज कर ठीक कर सकते है. Android, iphone smartphone hardware/software repairing course sikhne ke liye bahut hi badhiya book hai. Maine is ebook ki help se 100% course complete sikh liya hai. Agar aapke pas mobile phone jumper solution book hai to mujhe jarur btaye. Mainu lena hai. Agar aap mujhese puchenge ki, Mobile repairing course sikhene ke liye bahut achhi book konsi hai. Mera jawab honga - Advance Mobile Repairing Course eBook (pdf) in Hindi. Jante ho kyo ? Kyonki maine mobile repairing course in delhi me ek naami institute se sikha, fir bhi mai mobile phone repair krne se drta tha. Mai internet se mobile repair jumper picture, video, android app free download krke sikhta rahta, lekin mai or adhik confuse hota gya. Phir mujhe is ebook ka pta chala, maine ise download kiya or full mobile repairing course step by step in hindi me sikhata gya. Agar mujhe is ebook ke baare me pahle malum hota to mujhe delhi ke institute me 50 thousand kharch nhi krta hai. Kyonki mujhe pta hai ki yah ebook ek mobile repair institute se guna best course sikhene ko deti hai. Fees me mai apni mobile repairing shop ke liye tools or equipments buy kr skta tha. Please aap mere jaisi bevkoofi aap na kare. in this ebook given best easy way to learn, how to repair any mobile cell smart phone hardware & software problems step by in Hindi. I have listened that book is the best teacher in our life and I feel that's absolutely true after I get this mobile repairing course hindi book ... Really this is the best guide. Mai jab CourseCrown Noida UP Institute me Mobile Repairing course in Hindi 3 month ka course sikh raha tha, mujhe course bilkul samjh me nhi aa raha tha, ek din maine net par "mobile repairing course in hindi" search kiya to mujhe pothi.com Advance Mobile Repairing Course PDF Hindi ka pta chala. Maine ise turant buy krke download kr liya. is ebook me step by step course sikhana shuru kiya to mobile repair krna mere samjh me aane lga. fir mai institute me bhi course acche se samjhane lga. thanks sir, agar aap ye ebook nhi bnate to shayad main 15-20 thousand rupees lutane ke ad bhi kabhi mobile cell smartphone repair nhi sikh pata hai. This book is so much better for learner who want to learn Advance Chip level Mobile phone repairing. i totally like this book when I read this book is also helpful to Mobile Repairing step by step instructions in this book, thanks for making this book Sir this book helped me for increasing my mobile cell phone repairing experience love this book. Its really an awesome book. The course given in this book are much related to mobile repair institute practical level. This book guides us to become a mobile repair technician, us and also gives guidance to mobile repair any problem. By reading this book we can take the correct decision of mobile repairing solution for right problem. This ebook is very helpful for learning full mobile phone repairing course in Hindi. 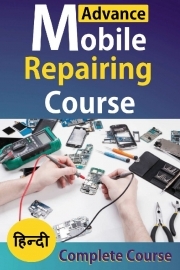 If you are new learner, please read this ebook before join mobile repairing course institute. I already learned mobile repair training course from Hi-Tech Institute in Delhi. after read this ebook, i am surprised. in this ebook, i learned more than course to institute.